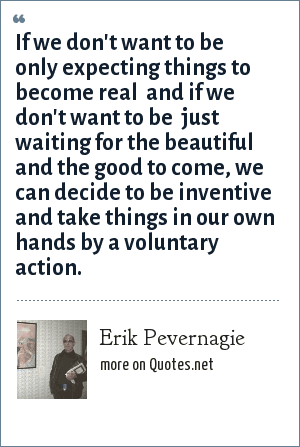 Erik Pevernagie: If we don't want to be only expecting things to become real and if we don't want to be just waiting for the beautiful and the good to come, we can decide to be inventive and take things in our own hands by a voluntary action. "Erik Pevernagie Quotes." Quotes.net. STANDS4 LLC, 2019. Web. 18 Apr. 2019. <https://www.quotes.net/quote/63679>.